If you are still thinking of owning one, you need to understand what this fuzzy animal requires for proper handling and maintenance. Like many other pets, a ferret needs proper food, enough space, and proper domestication. Before you bring a furball, you need to know much about those things that will make such a ferret live long while enjoying how you care for it. The average lifespan of this animal that has been well cared for is about 6 to 8 years. There are some that can even live for another year or two, however. There are a lot of factors that can affect a ferret’s lifespan, such as its diet, disease, stress, and even space or the housing provided for it. Note that a 1-year old is already considered full grown. Once your pet reaches ages 3 to 4, it’s considered middle-aged. But at 5 to 6 years of age, your pet ferret is taken as an old ferret. At this age, you may notice that your pet is slowly losing weight and is starting to develop debilitating illnesses. This may be a difficult time for you as you will soon have to say goodbye to your good-natured pet. It is quite unfortunate that such a pet has a genetically flawed feature that makes it prone to diseases. Even then, a ferret is an amazing pet and has an incredible desire to fight for its life. You can also do your part to help, and if you are able to provide a perfect environment where it can live longer, you can get to enjoy more time with your furball. One thing that you need to know about ferrets is that they can also be trouble magnets. If you are not able to ferret-proof your house, you might just find out one day that your pet has messed up so much around the house. If you have another pet, a dog or a cat perhaps, you may even see them terrifying them. They can be quite busy and playing hard for a length of time that your little bugger has found a way through the cracks and crevices in your home and started finding more nooks where it can play around in. And as domesticated ferrets don’t fear humans, you may find your pet in high-spirit at times. A ferret will usually need a lot of attention, so if you cannot give your pet that much time, you will need to find a playmate for it. If you leave one unattended for a long time, it may cause stress that can lead to some serious health issues to your little friend. If you let your furry friend, it can sleep for as long as 18-20 hours. Its sleeping habit may change, depending on factors such as the space provided for it, availability of food (or its diet), presence or absence of competition, and so on. During the few hours that your pet ferry is awake, it can be playing or doing a lot of mischievous things. Don’t let your furry friend escape from its cage just to get to where it wants to be or do what pleases it. You need to make sure that any door on its ferret cage can close real tight. The wires on its walls should be about 1.5 cm to 2.50 cm wide, the bottom should be solid, so there won’t be any chance that your pet will be getting out or getting stuck or injured while trying to get out. You will also need to provide a separate space for sleeping, eating, and relieving of its body wastes. Having levels within the cage will help to accomplish this. You will also need to make sure that there won’t be anything that your pet can chew that will cause any discomfort or sickness to your ferret. 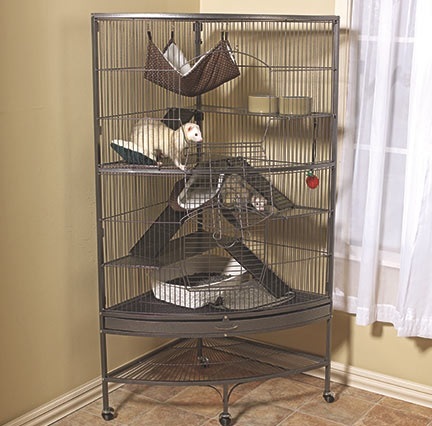 The best you can do to ensure that your pet is comfortable inside its cage is to observe how it moves about and uses its space. Anything that your pet does not use should be removed from its housing. You may also need to check on related animal welfare rules within your city or locality to guide you on the proper handling and management of a ferret that is under your care.